Introduction:	Chondromyxoid fibroma is a rare benign tumor that usually occurs in the long bones and rarely affects the sinonasal region. Both clinically and histologically, it is a difficult diagnosis and can be confused with malignant lesions. Objective: To present a case of chondromyxoid fibroma of the nasal bone and discuss its presentation. Case Report: A 48-year-old man with diagnosis of chondromyxoid fibroma of the nasal turbinates with local destruction and extension into the ethmoidal sinus. Final Comments: The complete surgical excision of this type of lesion is extremely important for long term control of the disease due to its high recurrence. The chondromyxoid fibroma is a rare osteocartilaginous benign tumor, composed of chondroid, fibrous and myxoid tissues. It represents 0.5% of all primary lesions and 2% of all benign bone lesions (1,2). There is a masculine prevalence, and it mostly occurs between the second and third decades (3,4). The lesion occurs generally in the lower ends long bones metaphysis, but any bone may be affected. The craniofacial region bones tumors are extremely rare, approximately 2% of the cases, and they often involve the jaw and maxilla. It generally presents as an active stage lesion, locally destructive with high recurrence (>25%) and does not undergo malignant transformation (5,6). It presents a relatively unique histological appearance with lobulations typical of spiculated and star-shaped cells, with a vast myxoid or chondroid intercellular material. 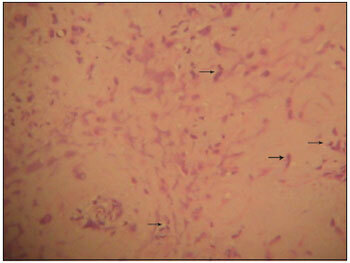 Lobulated areas; large pleomorphic cells may be present and get confused with chondrosarcoma (7). 48-year old male, white patient, with complaint of night snores and progressive left nasal obstruction and history of previous nasal surgery for nasal tumor excision 13 years ago and full improvement after surgery. Upon the prior rhinoscopy the lesion was identified occupying the agger nasi region, and expanding into lateral nasal wall. In the nasal endoscopy we viewed the lesion obliterating almost all the left nasal cavity, which made difficult the device progression into the cavity of concha. The tomographic study without contrast (CT) of the facial sinuses evidenced an expansive process of well-defined contours and rough calcification included in the left ethmoidal region, which projected into nasal cavity and presented adjacent osseous erosion and remodeling (Picture 1). Picture 1. CT of the facial sinuses in coronal (A) and axial (B) cuts without contrast evidencing an expansive process of well-defined contours and rough calcification included in the left ethmoidal region, projected onto nasal cavity and with adjacent osseous erosion and remodeling. The patient was submitted to endoscopic resection of the lesion expanded from the middle turbinate onto nasal septum and lateral nasal wall, which obliterated the agger nasi and middle meatus (Picture 2). We carried out the removal of the lesion and areas centripetally affected, beginning with incision in lateral nasal wall and subperiosteal displacement up to the posterior ethmoid parallel to the paryraceous lamina. After middle turbinectomy and displacement of the ethmoidal roof mass, it was released to the region of the cavity of concha and removed through the oral cavity (Picture 3). Picture 2. 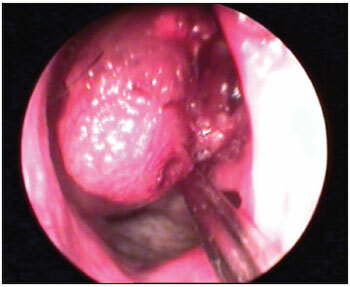 Endoscopic lesion of the vision in the left nasal cavity. The anatomopathological exam diagnosed myxoid proliferation (Picture 4). The clinical criterion indicated immunohistochemical exam for diagnostic definition. The immunohistochemical study confirmed the morphologic diagnosis of chondromyxoid fibroma and revealed a strong fibromyxoid proliferation in the tumor cells (Picture 5). Picture 4. Isolated tumor cells, without cohesivity of fusiform and/or star-shaped aspect (arrows), with large myxoid or chondroid intercellular material. (Hematoxylin and Eosin in increase of 10x). Picture 5. Immunohistochemical study for Vimentin: positive in the tumor cells (arrows) that are in the middle of the myxoid matrix, and evidences the lesion mesenquimal nature (increase 40x). Chondromyxoid fibroma is one of the rarest benign osseous tumors, represents less than 1% of all tumors and typically involves the long bones metaphyses. The involvement of craniofacial bones is extremely rare, represents 2% of this tumor cases and the jaw and maxilla are the mostly affected regions. It almost never involves sphenoid and ethmoid sinuses (1,2,5,7). The affected age range varies from 10 to 67 years, with peak of incidence in the second and third decades. There is a male prevalence; but when it comes to cranium and face bones, women prevail (2:1) (2). The clinical case ranges according to the area involved and is generally associated to the long history of nonspecific symptoms, mainly pain and edema (1). The radiological appearance is characteristic, but misses specificity. Osseous destruction areas, well-defined lobulated margins, partial cortical erosion and septations are viewed (1). It histologically presents lobulated areas of fibromyxomatous tissue prone to chondroid differentiation. The lobules show an increase of peripheral cellularity and are separated by fibrous septum of variable cellularity and prominent vascularization (1,4,7). The differential diagnosis is made mainly with chondrosarcoma (1,4,7), which also has a lobular standard and may have myxoid areas. 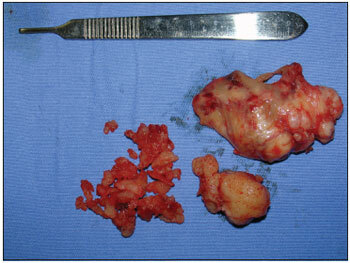 The chondromyxoid fibroma differs for its fibroid elements separating the lobes and also has well-distinguishable margin between the tumor and the normal tissue (4). 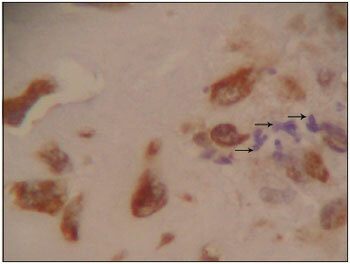 The chordoma is another differential diagnosis, and may be distinguished from FCM in immunohistochemical studies, since it expresses antigens like: Epithelial membrane antigen (EMA), protein S100 and cytokeratins, whereas this has only protein S100 (5,6). The diagnosis is made by the benign aspect in radiologic exam and classical histologic standard. In 22 to 28% of the cases the diagnosis is not carried out due to the non-familiarization with histologic standards due to the rarity of this tumor (1,2). The choice treatment is excision, due to the cosmetic and functional deformities of en block resection. It has recurrence in 25% of the cases (1,3), generally due to the incomplete removal of the lesion (5). Radioactive therapy is indicated when the tumor is surgically inaccessible (2). The nasal chondromyxoid fibroma is a rare and benign event; but it has a high recurrence after surgical treatment, which makes new interventions necessary for the suitable control of the disease. 1. Resident Doctor of the Otorhinolaryngology and Cervico-Facial Surgery Service of the Santa Casa de Misericórdia de Curitiba. 2. Otorhinolaryngologist Medical Doctor. Preceptor Doctor of the Otorhinolaryngology and Cervico-Facial Surgery Service of the Santa Casa de Misericórdia de Curitiba. 3. Otorhinolaryngologist at the Hospital Cajuru - PR. Institution: Irmandade da Santa Casa de Misericórdia de Curitiba. Curitiba / PR - Brazil. Article received on May 17, 2008.